Knitting Nannas Against Gas (KNAG) say energy companies are desecrating the land while giving no benefits to the locals. They were pushing for change at a two-hour knitting protest outside the office of NT Chief Minister Adam Giles. “We are parents and grandparents. However, we are carrying grave concern for the welfare and health of our children, our grandchildren and our potential great grandchildren,” KNAG member Margaret Alexander said in a statement. The KNAG movement was started in New South Wales in 2012, where outspoken and mostly elderly women wanted to show concern about unconventional gas exploration. It has been a contentious issue in the NT as well, with the Government recently trebling a 200-page report into hydraulic fracturing (“fracking”) in Parliament, which found no justification for a moratorium on the practice. Some geologists think the NT may contain vast reserves of oil and gas trapped in shale formations, which can be tapped by fracking technology. But opponents of the practice say it can contaminate ground water and deal a hefty blow to local ecosystems. 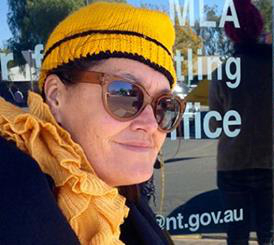 “We are outside Adam Giles' office because we are calling on the Giles Government to put in place a moratorium on shale gas extraction and fracking until it can be proven to be safe for both communities and the environment,” KNAG member Gerda Hawke said.